From creating original artwork to designing advertisements, graphic designers work in every state and every industry. According to the Bureau of Labor Statistics (BLS), graphic designers can earn a median salary of $48,700. Attaining a job in graphic design takes more than talent, practice, and professional experience; many management-level positions require an advanced degree. 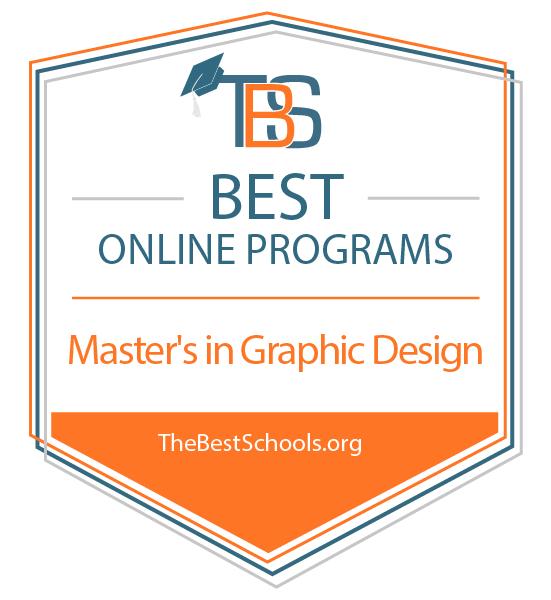 Fortunately, you can earn a master's in graphic design online in two years or less through one of many reputable online programs. In this article, learn how to choose the right program, courses, and career path. What Else Can I Expect From an Online Master's in Graphic Design Program? Online Master's in Graphic Design Degree Program Ranking Guidelines: We selected the degree programs based on the quality of program and range of courses provided, as well as school awards, rankings, and reputation. The master of fine arts in illustration at Syracuse University attracts students with a range of art education training, including those with minimal experience and professionals in the field. They develop skills in traditional and digital media, learning to tackle challenges in communicating ideas and messages through art. Some students study teaching techniques should they wish to become educators. The university complements its online courses with opportunities to study in New York and Los Angeles, plus Florence, Italy. Earning this online degree requires 60 credits and a three-year residency. Upon graduation, students know how to use various materials for illustration, engage in creative storytelling through art, and critically examine how the history of illustration shaped today's industry. The School of Arts also welcomes visiting artists through the year, including experts in animation, video gaming, editors, and art directors, many of whom are alumni. Syracuse is regionally accredited by the Middle States Commission on Higher Education (MSCHE). The online MFA program holds accreditation from the National Association of Schools of Art and Design (NASAD). Quinnipiac University offers an master of science in interactive media and communications, which equips learners to think creatively and strategically as they leverage contemporary media to communicate ideas. The program explores graphics, web design, and user interface/user experience (UI/UX) design. It also offers opportunities to gain certification in some areas of user experience design and social media, which employers often find attractive. Considered one of the top graphic design master's programs online, the curriculum builds skills in writing for interactive media, plus web technologies, visual storytelling, and data visualization. The program requires earning 30 credits, including 21 elective credits. All students must complete a capstone project that reflects the culmination of their work through a web-based portfolio. Leading firms in entertainment, advertising, and marketing recruit Quinnipiac graduates because of their production, management, and content creation skills. Quinnipiac is regionally accredited by the New England Commission of Higher Education (NECHE). A standout among online graphic design master's degree programs, the MA in emerging media design and development at Ball State helps students master effective storytelling across a range of modern communication platforms. This low-residency program develops learners' ability in human-computer interaction and design thinking. It also sharpens their skills in assessing the efficacy of their communication design and stories. Admission requires a resume, purpose statement, writing sample, and creative portfolio. The program attracts students with strong creative backgrounds in areas like videography and photography, plus learners with extensive technology experience in animation or computer programming. It requires 36 credits, and classes examine topics like transmedia storytelling and lab experiences, which engage learners in real-world problem solving. The lab requires learners to partner with a company of their choice to help address challenges, and culminates with either a thesis or creative project. Ball State is regionally accredited by the Higher Learning Commission (HLC). SCAD offers two graphic design online options. The MA in graphic design and visual experience requires 45 credit hours, and includes studies in voice and visual narrative and visual analysis of content. The MFA in graphic design and visual experience includes these courses plus an internship and multiple thesis projects, totaling 90 credit hours. Both examine a range of concepts including entrepreneurship, mobile technology, and user experience, ensuring students enjoy a comprehensive learning experience that prepares them for positions with leading organizations. Faculty resumes boast impressive backgrounds in the field, including professional experience with Walt Disney, American Express, and MTV. SCAD and its faculty provide an array of resources to help encourage learners' innovation and strengthen their skills. Creative spaces offer iMac workstations, printers and plotters, and saddle-stitch stapling machines. Students can also showcase their creations in a variety of outlets. Prestigious competitions like the Adobe Design Achievement Awards and Type Directors Club frequently honor SCAD students' outstanding work. SCAD is regionally accredited by the Southern Association of Colleges and Schools Commission on College (SACSCOC). The School of Arts at Samford University offers an MS in design studies through its interior architecture department. This online graphic design master's degree primarily focuses on design research and critical analysis, so learners can research their expertise more deeply and potentially embark on a design education career. Samford integrates a Christian perspective into its curriculum and helps graduates attain their career goals through challenging coursework. Classes explore design theory, quantitative and qualitative research methods, and design education pedagogy. Students examine trends in architecture, environmental design, and interior design. They can also apply that knowledge to design education or design research roles. The two-year program begins each summer, and requires 33 credits. Students must also develop a master's thesis over the course of their studies. Samford is regionally accredited by the Southern Association of Colleges and Schools Commission on College (SACSCOC). Liberty University awards an MFA in graphic design that equips students to communicate in a visually appealing way through digital imaging and illustration, typography, and design techniques. Graduates are prepared to fulfill companies' design needs, giving them a competitive edge in the professional world. Liberty's online graphic design master's degree combines classwork and experiential opportunities to engage students in hands-on learning. A Christian institution, Liberty ensures its MFA curriculum aligns with its spiritual perspective so learners can balance their personal, professional, and academic demands, while also maintaining community involvement. Courses in the history of graphic design and publication design complement the required 180-hour internship, which pairs each student with a professional in the field. In addition, a 90-hour practicum helps students develop a portfolio to showcase their creative work. Both the internship and practicum help learners bridge the gap between the classroom and the workplace as they explore career options. Liberty is regionally accredited by the Southern Association of Colleges and Schools Commission on College (SACSCOC). Radford University's visual and performing arts college is home to one of the country's leading online master's programs in graphic design. Radford's MFA in design thinking promotes innovation, creativity, and problem-solving, preparing students to address global challenges. The 60-credit program immerses learners in design history and research, and challenges them with team-oriented, experimental activities in virtual studios. Radford does not require previous coursework or a degree in design for enrollment. Rather, the program attracts those who wish to advance professionally by deepening their understanding of design methodologies. Course topics include international art history and instructional design and evaluation. The degree also requires a research project or thesis. Students can complete their degree in two or four years, depending whether they enroll full- or part-time. Graduates often pursue careers as policymakers, consultants, professors, and management executives. Radford is regionally accredited by the Southern Association of Colleges and Schools Commission on College (SACSCOC). The master of professional studies in UX design at MICA explores the computer and design aspects of the user experience in today's technology-driven world. This online program uses Google tools for instructional purposes and requires a campus-based residency. This allows students to collaborate with each other, establish networks with peers and faculty, receive critiques from professionals in the field, and understand best practices in the discipline. Classes examine the fundamentals of interface design, prototyping, and project management to understand their applicability to industries like healthcare, education, and gaming. The program especially appeals to those with design backgrounds, such as in graphic or visual interaction, and learners who wish to combine their creative talents with research and critical analysis. MICA's 30-credit, 15-month program gives graduates a competitive edge in the professional world. MICA is regionally accredited by the Middle States Commission on Higher Education (MSCHE). The online MPS in UX design is fully accredited by the National Association of Schools of Art and Design (NASAD). Kent State University offers an MS in user experience design that ranks among the top in the nation. It challenges students with rigorous, relevant learning experiences, aligned with the latest trends and developments in the field. Industry-respected faculty facilitate course instruction, helping students make strong connections with employers. Learners can complete the flexible, fully online curriculum in as little as two years. Coursework deepens their knowledge of design, information architecture, and human-centered thinking, helping learners understand how to create a successful user interface. This includes an interface's psychological, emotional, and structural elements, whether web- or mobile-based. Kent State's program prides itself on training user experience designers who can succeed in an array of digitally driven organizations. The curriculum model focuses on designing solutions and evaluating those designs. Kent State is regionally accredited by the Higher Learning Commission (HLC). The online MS in user experience design is fully accredited by the National Association of Schools of Art and Design (NASAD). Ranked among the best online graphic design master's programs in the U.S., Kutztown University's MFA in communication design equips students with expert communication design skills. This program aims to foster a community of highly collaborative and artistic thinkers, engaging students in real-world experiences through a combination of coursework and a three-class thesis initiative. Kutztown's graphic design curriculum strengthens learners' creative, research, and implementation skills, as demonstrated by public projects they showcase in various outlets. With 12 full-time faculty, the 60-credit program encourages students to pursue their primary interests in areas such as advertising design, illustration, interactive design, and education. Classes explore topics like emerging media and typography. The program exists primarily online, but also mandates three weeks of on-campus study each year. Successful applicants must have at least a 3.0 GPA in their undergraduate studies, plus an artist's statement, a portfolio of digital slides, and references. Kutztown is regionally accredited by the Middle States Commission on Higher Education (MSCHE). Its online MFA in communication design is fully accredited by the National Association of Schools of Art and Design (NASAD). Selecting the right program begins with discovering why you want to earn your online graphic design master's degree. To answer this question, first examine programs' concentrations. Some concentrations, such as brand development, appeal to students interested in managerial jobs at large marketing agencies. Others, such as exhibition design, attract students preparing for careers as independent artists. Choosing one or two concentrations that interest you automatically creates a shortlist, which you should later analyze in closer detail. Once you create a shortlist, focus on each program's courses and educational experience. The majority of programs stress advanced design courses alongside those that teach valuable interpersonal, leadership, and business skills. Finally, the graphic design master's degree online program you select should meet all of your online learning needs. With so many online options, you do not need to sacrifice quality for convenience. While virtually all online graphic design master's programs teach similar skills, they offer unique curricula. Some focus on one graphic design subfield, while others present a more holistic approach. Keep this in mind as you explore the sample courses below. Courses at programs you consider may use similar titles or course descriptions but a different curriculum. Students learn about graphic design's role in advertising products and services. Class activities include analyzing famous brand development examples and developing graphics for new products. Students interested in marketing take one or more brand development courses. Students develop new ways to use design in their projects as they critique each other's work. Most master's students take this or a similar course during their first year. This course conveys crucial interpersonal skills all graphic designers require to work with clients. Course topics include interview and communication skills and relationship-building. To stay successful, graphic designers must learn new technologies and collaborate with peers. This course introduces students to research methods and latest graphic design tools. Most master's programs include a thesis course wherein students research and craft their thesis. Some programs may require students to write a lengthy research essay, while others programs ask students to complete a design project that includes a presentation to faculty and peers. Online graphic design master's degree programs prepare graduates for managerial-level positions that require a single person to oversee an entire project. Some graduates use these skills as classroom teachers, while other graphic designers use their graduate educations to launch their careers as self-employed artists. The three positions below represent a few jobs you can explore after earning your degree. Graphic design postsecondary teachers instruct students at colleges and universities, create lesson plans and rubrics, evaluate students' work, and mentor students' development as artists. Nearly all postsecondary teaching positions require a master's or doctoral degree. Most professionals who enter this position also have at least five years of work experience in the graphic design field. Art directors lead teams of artists to create unique visual products for their clients (e.g., movie posters, product packaging, and commercials). As managers, they control their projects' every facet and mentor less-experienced graphic designers. A master's degree conveys the managerial and interpersonal skills required for this position. Multimedia artists use digital tools to create original artwork and animations for advertisements, games, and movies. Many artists and animators specialize in a particular field like facial animation, making them highly valuable employees. A master's program allows students to select and develop skills related to a specific specialty.